Sign up in the GC office for the Employees’ Invitational golf tournament. Eighteen holes, two- or three-player scratch scramble. Entry fee 500p. Green fees and cart rentals are not included in the entry fee. Ladies are most welcome to participate. Some of the entry fee pays for a big outdoor feast and fiesta after play. What's left will be combined with any collected donations, and half of this total will be split among the top employee finishers, with the other half raffled to course employees. Employees will select/be assigned partners from among the paid players on the list. Your chance to be included in this fun and delicious event depends upon how soon you sign up and pay; the number of playing employees is not large. Cutoff for payment will be Friday, 4-12. Non-golfing spouses or guests may sign up for 250p to join in the fiesta. Please indicate when signing up whether you are playing or just partying. Anyone, whether playing or not, is encouraged to donate to the employees' prize and raffle fund by putting cash in he labeled can in the GC office. 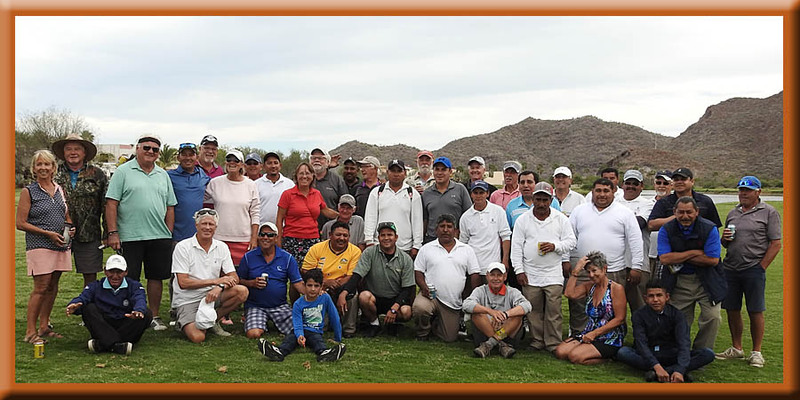 These golf course workers are the reason the course is playable for us, and the tournament and raffle prizes are a chance for us golfers to show them we appreciate their efforts. Here's one way we can say, "Thank You Very Much."